This design is intended to be an exact rendition of the 'Trailer for Two' plans that appeared in Mechanix Illustrated in September 1947. 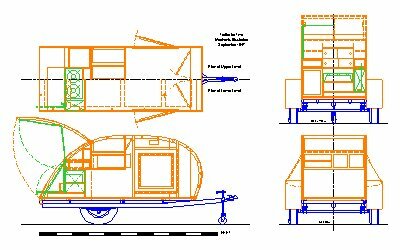 It is doubtful that anyone would today build this design as it was drawn but it is a valuable resource to look at when considering your own teardrop design. 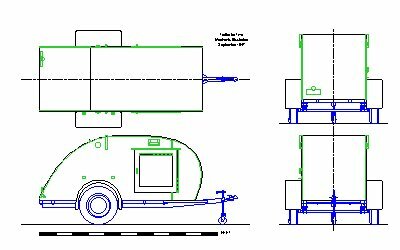 There are some errors in the original drawings which are mentioned in the CAD file. I hope that I have not introduced any new errors, but that is probably too optimistic. If you find any, please do let me know - e-mail me (remove the NOSPAM. from the address). These drawings should be viewed read in conjunction with the original magazine article. You can get them from the Tiny Tears Scans page (scroll down to 'Trailer for Two'). This drawing contains all views in one zipped .dxf file.